Both sides scored penalties as Girona slipped to a 4-2 loss in the first leg of the Copa del Rey quarter-final. Real Madrid defender Sergio Ramos. 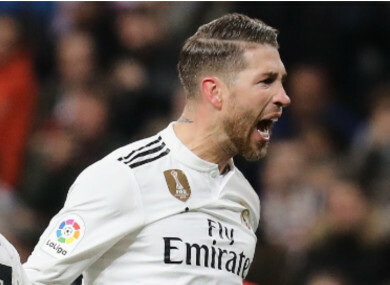 SERGIO RAMOS SCORED twice as Real Madrid earned a 4-2 lead in a pulsating first leg of their Copa del Rey quarter-final at home to Girona. Anthony Lozano gave Girona an early lead at the Santiago Bernabeu on Thursday, but Madrid battled back thanks to Lucas Vazquez’s equaliser and a Ramos penalty. Another spot-kick saw Girona equalise, Alex Granell stepping up to convert after Marcos Llorente needlessly handled the ball in the box, but Ramos and Karim Benzema struck late. Madrid’s captain rose highest in the box to crash home a header from Marcelo’s cross and Girona’s hopes were dashed when Benzema slotted in a Vinicius Junior cross. Madrid forced a trio of early corners, but Girona took the lead with their first attack in the seventh minute, Raul Garcia given too much space on the left to deliver a cross Lozano met on the volley. The hosts soon levelled, though, Benzema sending Alvaro Odriozola clear in the right channel to pull back a low pass that Vazquez placed home. Madrid led in the 42nd minute, Ramos beating Gorka Iraizoz with a Panenka from the spot after Vinicius’s feet were too quick for Lozano on the edge of the box. Benzema clipped the post before the break but when Llorente thrust out his hand to deflect a cross Girona made the tie all square, Granell confidently smashing his penalty beyond Thibaut Courtois. Vinicius was involved again as Madrid regained the lead in the 77th minute, getting into space on the left to tee up Marcelo for a cross Ramos was never going to miss. Madrid were not finished, however, and substitute Isco threaded a pass through for Vinicius, who slipped a low cross into the box that Benzema gobbled up to give Santiago Solari’s side a two-goal cushion. Email “Sergio Ramos double gives Real Madrid quarter-final boost”. Feedback on “Sergio Ramos double gives Real Madrid quarter-final boost”.